Ante-post betting is the wagering of money on something before it gets underway, usually at least a day or more before the event starts but often weeks or even months in advance. There’s an extent to which it’s an art rather than a science, with punters trying to predict any number of variables in order to win money from the eventual outcome. The risk you take is that you don’t even come close, losing your stake in the process. Yet the potential reward is that you’re able to place a bet with large odds well before anyone else realises that it’s a possible winner. When José Mourinho won the Premier League with Chelsea in 2014-2015, they finished eight points clear of Manchester City in second. Leicester City, meanwhile, only avoided relegation by six points. There was nothing in the runes to suggest that the Foxes’s appointment of Claudio Ranieri would turn them into title challengers, or that Mourinho would over-see a self-implosion from the Stamford Bridge club that would see them ending up in tenth at the end of the season. In other words, ante-post betting is hard. That rather naturally leads us to ask: is it worth it? Is there good value in ante-post betting? Are there any things we need to think about before placing our bets? The most important place to start is ensuring that we’re all on the same page with what we’re talking about, especially given the fact that ‘ante-post’ sounds like a confusing phrase. ‘Post’ is the Latin word for ‘after’ or ‘behind’, whilst ‘ante’ means ‘before’. That means that the phrase as a whole could mean ‘before-after’, so it’s no wonder that not everyone understands it when they first read it! This one is fairly self-explanatory, with bets being placed on the team that you think will win the league. I’ll look in more detail at this type of bet shortly, but the basic thing here is to bear in mind that you’re placing your bet on the club that you think will be most successful across the course of a season, ultimately finishing in the top spot. Other markets you can look out for include ‘League Winners Without The Favourite’, but they’re essentially the same type of bet. I’ve written a piece elsewhere that you might want to check out, looking at relegation betting in general. This is where you can place a bet on a team that you think is going to be relegated out of the league at the end of the campaign. Different leagues have different rules, but if we look at the Premier League as an example then you’ll see that the bottom three teams when all thirty-eight games have been played will find themselves going down into the Championship. That’s what you’re placing a bet on happening to your chosen team. 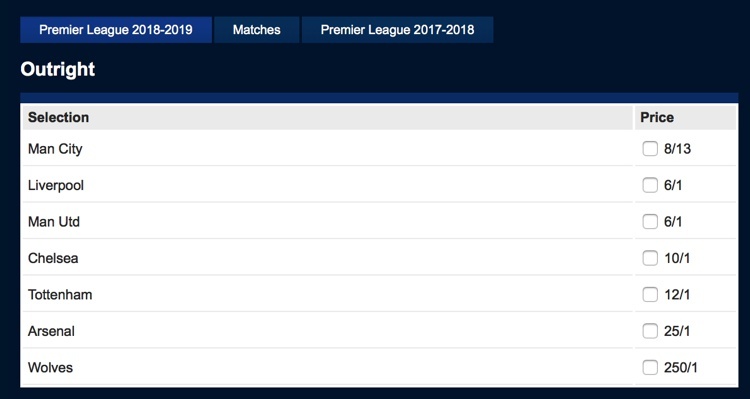 This is a bit different to pre-season league betting, simply because you’re betting on a one-off tournament such as the World Cup, European Championships or the Champions League. Again, there are a few variations on a theme on this front. You can place pre-tournament bets on which teams will win their group, for example, or on the overall winner of the competition. The rules are generally the same, though, with the team you’re betting on needing to do what you’ve said they will in order for you to win money. This is betting on individual events rather than the competition as a whole. Here you’re looking at things like Correct Score, Match Winner or To Qualify bets. Each of them works slightly differently and has individual rules that you’ll need to watch out for. Correct Score bets, for example, only apply to ninety minute matches unless otherwise specified. That means that if the match is in a knockout tournament and could go to extra-time or penalties then your bet will end after the original ninety minutes is over. This market can apply to both league campaigns and one-off tournaments and is a bet on a player to achieve something, which is normally finishing as Top Scorer. This is often referred to as the Golden Boot, though you’d do well to see how the bookmaker phrases the bet type. I’ve written about Dead Heats in a more in-depth capacity elsewhere on this site, but one thing I’ll mention is that it’s important to keep an eye on the wording used. Top Scorer bets could well end up in a Dead Heat, meaning that your bet won’t be paid out at full value. Golden Boot winners, however, tend to be settled according to specific rules laid out by the organisers of the competition, so you might think that your bet’s a winner because your chosen player scored the same goals as other high-scoring players, yet you won’t be paid out because they weren’t declared the Golden Boot winner by the competition’s organiser. Winning a league isn’t easy. There’s certainly a link between the amount of money spent on wages and the position clubs finish in the league, though it isn’t a given that spending the most money will automatically mean you win the title. One thing that’s important to remember from a betting point of view is that winning a league requires a squad that is full of depth, so sides with fewer players that the manager feels confident about using are less likely to win it than those with a squad filled with talented players. In the Premier League, for example, teams have to play thirty-eight matches across the course of a season, meaning it’s more like a slog than a sprint. Something else that matters on that front is fitness and a team’s ability to recover from injuries. Both Leicester City and Chelsea have won the top-flight title in recent times making few changes, but they also got very fortunate on the injury front. Now obviously that’s something you can’t necessarily predict, yet you can have a look at whether a team tends to have injury issues or whether they’ve done something interesting on the coaching staff front, such as bring in a new fitness coach or nutritionist. It might sound silly, but that’s the sort of research that will separate your bet from ones that are little more than picking a name out of a hat. The last thing I’ll mention when it comes to betting on the league is that it’s not necessarily worth betting on the team that won it the previous year. Obviously sides in lower divisions can’t win it again the next year because by winning it they’ll have secured promotion to the league above them, whilst no team has retained the Premier League title since Alex Ferguson’s Manchester United won it three times in a row from 2006-2007 to 2008-2009. Make sure you look at the situation in the league that you’re betting on, though. In Germany, as an example, Bayern Munich won the title on all but two occasions between 2009-2010 and 2017-2018. If the league isn’t competitive, it might be worth looking for a ‘League Winners Without X’ market. If you’re interested in Relegation betting then it’s definitely worth checking out the piece I’ve written looking at exactly that, so I won’t go into too much detail here. I will say, though, that there are several things worth thinking about before you place your bet. Has a team changed ownership recently? Have they been getting worse year-on-year? Have they sold a really important player? Has the manager left or been forced out? All of those things can cause issues for teams as they head into a new season, so they’re the sorts of things you’ll want to look out for. As always, research is your best friend when it comes to ante-post betting. After all, you’re looking to place a bet on something that will occur over the best part of nine months, so get yourself as much information as you can. As I said before, there are definitely similarities between League bets and Tournament bets when it comes to the ante-post markets on each. I’m not going to repeat the advice from above therefore, but it’s worth looking again and seeing if there are any hints and tips that you think are applicable here. The major difference is that tournaments are won over far fewer matches. That said, you’ll still need to think about the size of the squad if you’re looking at a tournament such as the FA Cup of Champions League, which runs alongside the domestic league. In that instance you’ll also want to see if managers have a strong predilection for winning the tournament. José Mourinho, for example, won the League Cup in his first year at both Manchester United and Chelsea. When you’re moving away from domestic trophies and looking more specifically at international tournaments, the things you’ll want to think about change again. For starters, the amount of money each player earns in wages becomes entirely pointless when they leave their club for their national side. What does become more important, however, is the ability of a squad to work together as a unit. Is there anything you can learn from the training techniques of a national side? Have there been rumours in the media about a bust-up between the manager and a star player or between two of the players in the squad? Squad sizes are the same, but the depth of quality within them aren’t. That doesn’t matter as much as it does in the Premier League, given that the winners of the 2018 FIFA World Cup will need to win seven matches, but the proximity of those matches to each other as well as the chance that they’ll go into extra-time or penalties means the number of players available to the coach may matter. Two other things are deserving of your consideration before you place your bet on international tournaments: how have the teams done in qualifying and how strong is their group in the initial phase of the competition? A team that has won every single game they’ve played in the qualifying period will not only be feeling confident but will give other sides something to worry about. Likewise, a side that only just scraped through the qualifying phase might not be feeling all that confident ahead of the start of the tournament. If they’re then drawn into a group with a couple of the favourites to win it then the chance of them even making it through the initial stage might be drop considerably. All of that information will be available ahead of the start of the competition, meaning you can think about it before placing your ante-post bets. Ante-post bets on individual matches are arguably the easiest to place because of the sheer amount of information that you’ll have available to you. Unlike with both league and tournament betting, you’ll know exactly which players will be available for selection and which ones are injured or suspended. You’ll also know the form of both teams and whether or not they’ve got a big game coming up after the one that you’re looking to bet on. In the Premier League, for example, the top sides might well have a Champions League knockout stage match to think about towards the end of the season, meaning that managers might be tempted to rotate the team around. You’ll also have access to information on other variables that won’t be available to you ahead of the start of a tournament or league campaign, such as the referee for the match. The Football Association likes to pretend that their referees are all impartial and we all like to agree with them, yet the stats say something different. As an example, Michael Oliver was selected as the referee for the Premier League match between Everton and Liverpool in April of the 2017-2018 season. Prior to the game a statistician discovered that he’d awarded four more penalties to them than any other side during his career. That’s not to say that he was biased in favour of the Blues, simply that you’d want to think about that sort of thing before placing your bet. It’s easy when you think about it, but the more research you do the more likely it is that you’ll find a winning bet. If you’re going to place a bet on the achievements of a player in the ante-post market then you’ll want to have a look at if they’ve got any history that might influence the outcome of your bet. Have they got a history of scoring in major tournaments like the European Championships, for example? Do they tend to get injured for a long period of time every season in a way that could stop them from scoring regularly? Are there any other players that are likely to score more than them? You’re betting on the top scorer, of course, so thinking about whether any teams have signed a player that knows how to score goals will tell you a lot. Equally, if you’re betting on the Golden Boot market then you’ll want to see whether or not your selected player tends to get a number of assists. That can often be used by the competition organisers as the thing that separates two players that have scored the same number of goals over the course of the tournament. 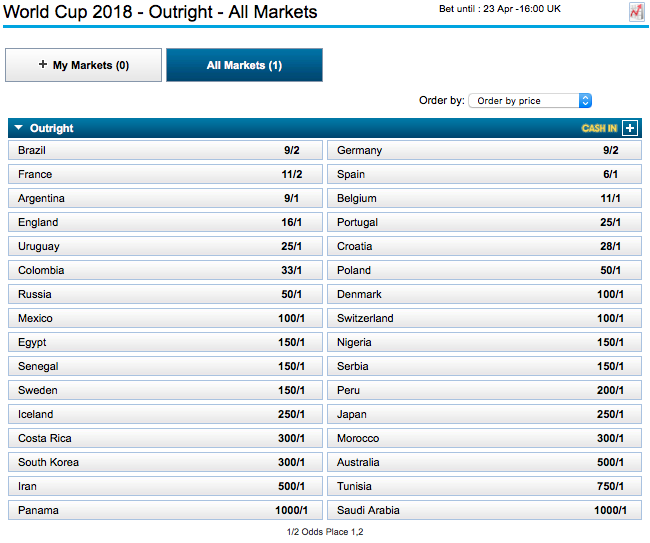 If you’re betting on an international tournament then you’ll also want to think about how far the team that the player plays for is likely to go in the competition. The best goalscorer in the world could play for a team that is unlikely to make it out of the group stage, meaning that a goal in every game would still only return three goals. A lesser goalscorer might scorer a goal every other game and equal that, so you’ll have to look at which players play for which teams and how far into the competition you think they’ll get. The main reason that ante-post bets are worth thinking about is that there is incredible value to be found in placing your bets before a competition gets underway. Bookmakers don’t really have much more of an idea that you or I how things are likely to pan out, so you’ll almost certainly find that you can get much longer odds on teams winning the league, winning a competition or getting relegated if you look at your bets in advance. I’ve done a whole section on that with regards to relegation in particular in my Relegation Betting article, so do go and check that out for some ideas of how the odds tend to shift as the season goes on. You can see from the table that the odds on Manchester City winning the title were decent enough in the ante-post market, even if they were clear favourites to do so. It’s slightly unfair to look at the rest of the field, given that with six games to go Pep Guardiola’s team were thirteen points clear of their nearest competitor having played the same number of games. It would have been interesting to know how much the odds differed if Manchester United were only five or six points away from their city neighbours. Given that United were 1/5 to finish second at that same point and Liverpool were 14/1 to do so, you could say that the odds would be closer even if it was clear that City were still the bookmakers’s favourites. Even if things were closer, though, you’re far more likely to find value in the ante-post market. That’s especially the case if you want to bet on the favourites. It won’t take many teams for them to suddenly drop in price after the start of the league campaign, especially if, like Manchester City, they enjoyed an almost unparalleled league season the previous year. Ante-post bets can be a brilliant way of placing something akin to a security bet, getting your wager in early before the bookies start to shift their odds after the first ball has been kicked and they’ve got something of an idea about how the game is likely to go. One of the most popular bets is to have an ante-post accumulator on the winners of several leagues, such as the Premier League, Bundesliga, La Liga and Ligue 1. You’ll get long odds even if you select the favourites in each country. Finally, just a quick mention of things you’ll want to remember before you place your bets. In most instances, you won’t get your money back if you bet on a team that doesn’t make it to the main competition itself. Let’s say that you’ve placed a bet on Italy to win the European Championships, say, but Italy don’t make it through the qualifying period and aren’t at the next Euros. In that instance you’ll almost certainly lose your bet, unless the bookmaker you choose to bet with has rules in place similar to Non-Runner, Not Bet rules in horse racing. That is the risk that you take with ante-post betting, but the reward is a payback in the form of much longer odds than you’ll get if you want until closer to the time that the competition gets underway. 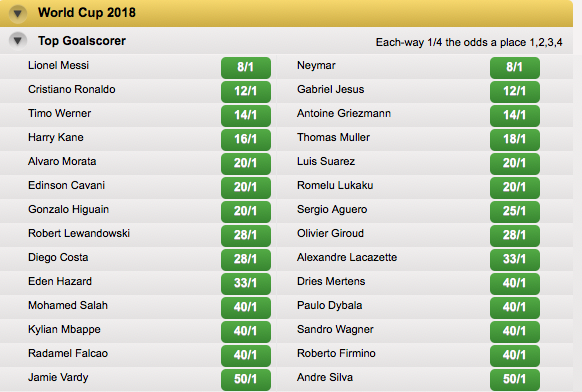 Similarly there’ll be no sympathy from the bookies if the striker you bet on to be top scorer gets injured in the first five minutes of a tournament’s opening game. You’re also in a situation with ante-post bets where you’re tying your money up to such an extent that you won’t be able to use it until the bet you’ve made is settled. You might be able to Cash Out, but would you want to do that if you’ve placed it well ahead of time in order to catch the best odds? Probably not, meaning that you’ll need to make sure that you’ve got enough money to place additional bets if that’s what you fancy doing. You’ll have to decide for yourself whether the potential rewards outweigh the risks, but hopefully I’ve given you enough information here to reach a sensible conclusion depending on the bet you’re thinking of placing.